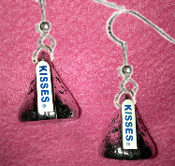 Funky CHOCOLATE CANDY KISS EARRINGS - Novelty Kisses Treat Fun Junk Fun Food Snack Treat Love Charm Costume Jewelry - Realistic licensed Kurt Adler Hershey's traditional classic silver plastic charms miniature ornament, approx. 1-inch (2.5cm) diameter. 3-D Round Dimensional candy shape (NOT flat). Give someone you love a little KISS!